- Spud & Chloe's blog - Spud says! Thank you so much, Susan, for being our guest! Please come back and visit us anytime!! This week's sponsor, Spud & Chloe, was so very generous to offer a chance for one very lucky follower to win NINE skeins of Spud & Chloe Fine, the Popsicle Socks pattern, and a super cool Spud & Chloe box! 2. Leave a comment on this blog post by the end of Sunday, 8/22/10, just saying HI! Susan wanted this week's comments to be simple and without any directions. Have fun! Hi to both Ve and Susan! I love reading your blogs. Wow! I checked it twice - yippee! First time I've won!!! !Thank you! Hi! These giveaways are so much fun. Have a great day. And good morning and hi! Hi! And what a fabulous giveaway. I have not had the chance to knit with Spud & Cloe yarns yet, but soon, very soon. Also, I just have to say that I absolutely adore Susan B. Anderson's Patterns. I have both Itty Bitty Hats and Nursery, but the toys are my favorite yet, so I must get my hands on that one. Thanks for the giveaway! 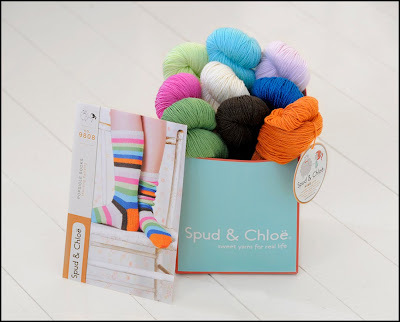 I would love a chance to win some Spud and Chloe yarn. I love Susan's designs. This is a great give away! I follow Susan's blog and Spud and Chloe's and i've always wondered what the Spud and Chloe yarn felt like! wait, not felt, but to fell felt. haha!! I just love stripes. Those are lovely socks! Hi Ve, HI Susan! I LOVE those socks and would LOVE to make them as my first pair!!! O.M.G. I LOVED this interview. I have all of Susan's Itty Bitty books and it was so fun to actually feel like I was able to sit down with her! Thank you so much, Ve! Hi! I love Spud & Chloe! What an awesome giveaway! I love Spud & Chloe! Susan rocks! (= I love the popsicle socks! Hi Ve and Susan! I am presently moving (what a freaking mess) but I took the time to read the blogs and watch the videos. All I can say is WONDERFUL. I've heard a lot about spud and cloe but I haven't yet seen it in person. The socks are cute! Wow! What a great giveaway! I love Susan B. Anderson's patterns! Hi and thanks for these wonderful blog and yarn !! Hi! Ooooh, fun pattern & gorgeous yarn! Hi! I love the range of knitting stuff you cover on your blog. Hi to both of you! Love S&C!! Love this blog! Have a fantastic week! HI! OMG me this time puleeeeease. Fun and great Giveaway! Enjoying the interviews. I love Susan and Spud and Chloe :) Would love to have all of this beautiful yarn! Hi All! The yarn in is gorgeous! Hi - What a great box of yarn. Hi! S&C is my fav! Thanks! Hi. I just love those popsicle socks. I love the designs in the Itty Bitty books! I have to knit the flamingo! I met Susan when she was promoting "Itty Bitty Toys," and she is seriously the NICEST person! What a great giveaway! I read Susan's blog, too - love it! Hi to you and Susan. 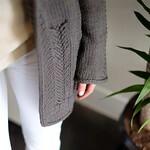 I am in love with Spud and Chloe Sweater, and would love the chance to work with Fine. Hi! I love the Spud and Chloe line! GREETINGS & WOW quite the giveaway, that 29th one. Count me in! HHIIIII!!! WOO HOO! I LOVE Spud and Chloe!!! And Susan is AWESOME!! Thank you for these give aways! Hi Susan! Love seeing you in the video! Good morning! Awesome giveaway! I've heard lots about Spud & Chloe but have never knit with it! I love all the patterns on the website. Oooh, I love "happy feet" socks. These look particularly happy. Never knit with this yarn yet. I'm a big fan of Susan's and Spud and Chloe. Love Spud and Chloe yarn. Currently having a grand time knitting the Dream Catcher Baby Blanket. Hi! What a great giveaway! Thanks! I have never used Spud & Cloe yarns before! THe do look yummy! I really love Spud and Chloe, and have been eying that sock pattern for a while now. This is such a great giveaway!! Howdy. :) Love the giveaway! Hi, I just found your blog today after reading Knitted Bliss then clicking on the link to the lovely Never Not Knitting (which was new to me too)! I have all of Susan's Itty Bitty Books and love her patterns, this is a great giveaway and I'd love a chance to win. :) I'm adding you to my reads too. Love your blog. Hi! Great blog, and great video interview format! Knit on! Thanks for the give away. I just found the spud and chloe blog a few days ago and love it. Hi! That sock pattern makes my heart skip a beat! i love the spud & chloe blog! susan makes everything about it so interesting, and her personal style goes so well with that yarn. the yarn includes some of my favourite colours, i'd love to win it! Hi! Spud & Chloe yarn makes me happy! Hi from thankfully much cooler MN! Doh - the MN comment was from me, ccknits on Ravelry. Apparently I should drink my caffeine before posting. Sorry! Hi, Just found the Spud and Chloe blog last night. Love what I saw. Wonderful to see Susan over here at YOtH. 3 times because it's from Europe, can you hear me? HI...I am addicted to Spud and Chloe yarn! Hi Susan. Love your patterns and yarn! hi-diddly-ho, what a great giveaway! Hi! Thanks so much for an awesome giveaway! I follow Susan on twitter and found your blog with her interview from her tweet. I'm so glad that I did! Great interview and great blog!!!! I love Spud and Chloe!!!! Hi. I love all the Itty Bitty Books! I have yet to try the Spud and Chloe yarns, but every intention of doing so. Greetings and Salutations from San Diego!!! Thanks for this great giveaway. Hi there! Always wanted to work with Spud n' Chloe. Hi! greetings from Chile :D.
Hi to Susan! 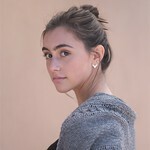 I am an avid reader of her blog and an adoring fan. I have all the Itty Bitty books and have made several of the hats for my daughter. I'm currently working on the hippo toy from Itty Bitty toys. Her patterns are so fun and classic. I also really love Spud & Chloe yarn and patterns. I have the baby bartlett set pattern & yarn that I need to knit at some point. Hi! And I have to also say that the prize this week is simply drool-worthy! Hello! Thanks so much for another great drawing! Hi! Love Spud & Chloe!! 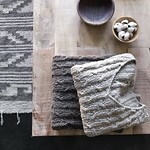 oooo I am loving Spud and Chloe and Yarn on the house and would welcome these goodies. Hi! I've been wanting to try Spud and Chloe for awhile now. Those yarns look so fun! Hi Ve and Susan! love those socks. Hi! :D Love Susan, love Susan's books & blogs, love YOTH, love Spud and Chloe....love all around! hi! this is an AWESOME giveaway- i love making socks! Hi - I just finished knitting a pair of socks made w/Spud and Chloe...first time using the yarn and it was fabulous. I love the color (Bright pink) and it provides wonderful stitch definition. Have a super day! Thanks for a great interview with Susan B. Anderson. I love her and her patterns! I have been seeing information on this yarn for quite some time and I have followed Susan B since I first started reading knitting blogs. Hi! I love a give-away! I never win, but I "meet" lots of new blogs and yarn sites this way. :) thanks!! Hi Susan! I m here! Thank you so much! Hi there! Love Spud and Chloe - thanks for the opportunity! Great interview! Love the giveaway, I can't wait to see who the lucky winner is. HI Ve! Thanks for the mega awesome offer! That's a super special prize, good luck to everyone! I'm PurlVerde on Ravelry, see ya 'round! Hi susan! Summer is winding down, hope your relaxing and not stuck in the traffic with the presidents visit today! Hi to both of you. I'm new to this blog but its great! I have never made socks- this would surely be a great reason to give them a go! hi, just love the spud and chloe yarn!!! wow! what a great prize. so much yummy yarn! Wow, can you say awesome? Hello and pick me, please! Hi-- Enjoyed the show. Looking forward to the raglan knitalong. Thanks for the Spud & Chloe giveaway. Hi ladies! Thanks so much for the wonderful podcast! I enjoy susan's designs so much! I love Spud & Chloe, and those socks are so great! Hi! :0) Love the Itty Bitty Toys book! I'm working my way through the projects. The socks look awesome, and I'd love to try the yarn out! I don't think I've seen it in the LYS's around here. Hi! What a wonderful Giveaway! Hi! What a great giveaway. Hi! I love Susan's patterns and Spud & Chloe! Hi! Great giveaway - thanks for the chance to win! I am very excited about this giveaway. I have been knitting with S&C Sweater since it first came out and LOVE it! My first knit was from Susan Itty Bitty Hats book and I have been hooked ever since. I would love to win this sock yarn and begin knitting socks....I have several S&C patterns to put in the box....Thanks for the opportunity! Hi Susan, I love your patterns and keeping up with your blog! Hi! love the sock yarn! love to win it! I have the book Itty Bitty Toys, and it's adorable! Susan looks adorable in her interview. Thanks for this wonderful giveaway. I'm a huge fan of Susan and S & C! Hi! Love S&C and Susan. This is a great blog and I need to add it to my list!